First and foremost, we are climbers. Before we are our day-jobs. Before we are our looks or personalities, before we are even life partners. Andy and I are climbers. It was and always will be our first love. And as climbers, we are always looking for new things and ‘firsts’. First falls,first ascents, first of this grade first of that, new routes, new places, new disciplines. Which meant that the opportunity to visit Norway in January would not pass us by. For Andy, this was his first time to a country he had long dreamed of visiting. 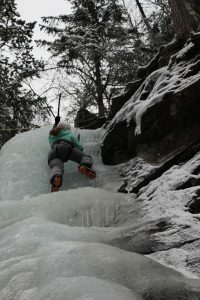 And for both of us, it was a new adventure into a discipline we had little to no prior experience of – ice climbing. 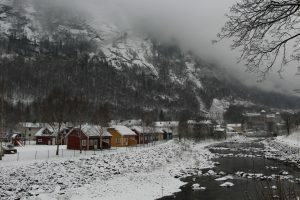 Rjukan is a small town situated about 2 hours west of Oslo and famous for the production of heavy water during the war (the film The Telemark Heroes is based on what happened in Rjukan during the war, the history of which can all be seen in the stunning old hydropower plant, now turned into Rjukan’s museum). 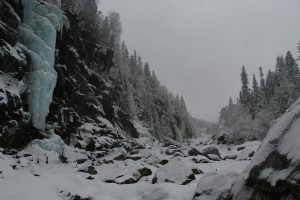 This is because Rjukan is full of waterfalls, which incidentally makes it a perfect place for ice climbing in the winter, with the small but enjoyable ski resort of Gaustatoppen a free, short bus ride away as a great alternative for those warmer days and any rest days. 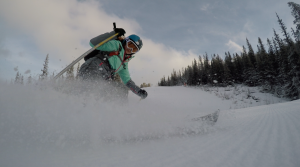 It is well known that winter conditions can be a bit hit and miss. The later you leave it, the bigger risk you take, but also the more the risk could pull off. Being our first time, we didn’t want to risk it. Instead we ventured at the end of January/beginning of February, and found that some of the more popular routes were just about ‘in’ when we arrived to the town, with more snow and freeze/thaw conditions on the way – lucky for us! After spending some time exploring Oslo, Andy and I arrived at the Old School Hostel via scenic routes taken by public transport. Our base for the week and a quaint, friendly place, popular with climbers for being a Black Diamond test centre (and it’s range of La Sportiva boots available to borrow), ever being improved upon by its lovely owner Jakob. Jakob ensured we had everything we needed and were settled – pouring over a local guidebook – before getting back to his impressive DIY work. Up and at ‘em, our first crag to visit was Ozzimosis. 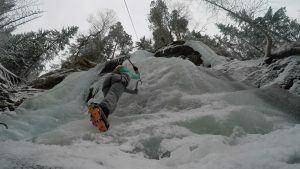 A popular one for easy routes, the ice was fairly well formed if a bit wet, and we started by putting our rock climbing skills to good use – finding natural features in the ice. Our first climbs felt slow and cumbersome, but this soon started to speed up after we started to realise the subtleties and differences between ice climbing and rock climbing. Not to be gentle with your crampons or axes, keeping feet level in all senses of the word, and placing axes one above another – keeping a triangular shape between your axe and your feet. The sunlight doesn’t last long in Norway and winter, so luckily for us, after about 4 or 5 climbs we were knackered, and the light was getting low. It was time to head back, massage our quads and our forearms, have some good food and chat with the other people staying at the hostel about their days conquers, and start all over again the next day. This time, we headed to Krokan. Again, another popular, easy beginner’s area with some beautifully formed climbs ready and waiting for us. 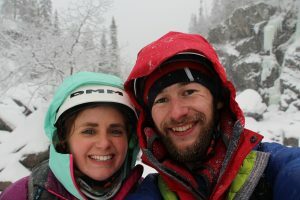 We tied in and immediately jumped on the ice, trying to focus on practicing good technique such as monkey hangs, enjoying the snow that was falling around us and totally absorbed in the moment. 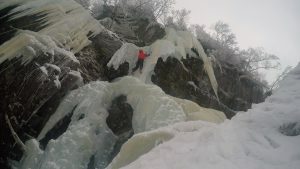 Every year Rjukan holds one of the biggest ice climbing festivals in this area, and it’s easy to see why. The big names and brands descend on the town and the locals come out in force too. From women’s only clinics to the must-watch speed ice climbing finals, festival is a big attraction and well worth a look in, if just to enjoy the show! Once again the light began to fade, and we found ourselves tired from using muscles that we didn’t normally use quite as much in rock climbing compared to ice climbing. But the smiles on our faces said it all. 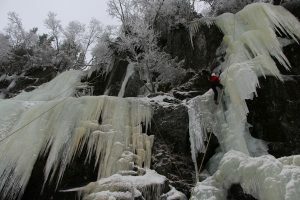 Ice climbing was something we weren’t going to forget about in a hurry, and Norway was definitely a place we were going to return to, no doubt about it, and both have left with dreams of scaling the ice back in the U.K. as well. 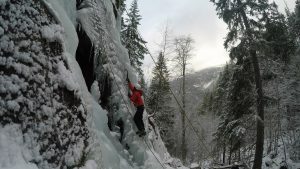 For ice climbing courses based in Rjukan, we can recommend Skyhook guiding,who can cater for most levels and design a lot of their courses to fit around along weekend so you don’t have to take too much time out of work.